I had heard it time and time again. I probably repeated it in my sleep. “As long as you’re flexible you will be fine.” Flexible? I can do flexible! Those words convinced me to accept a part-time position at an elementary school situated off the island of Montreal in the beautiful, picturesque and incredibly bilingual community of Saint-Lazare. I was overjoyed and incredibly nervous. While my academic background is history and my training and experience was with high school students, I was anxious, eager and considered this to be the beginning of an amazing adventure. As the Grade 5 and 6 Literacy Teacher at Evergreen Elementary my task is to help increase the literacy scores of our school. Although literacy is my primary focus, I teach this course differently than my predecessors. My main objective is to have my students think critically about what it is they are studying. re, My students, therefore, study and work around themes. Because I only see each class for 50 minutes a week, the entire class is project based. Our first major project was to organize a Remembrance Day Ceremony. Although remembrance had previously been observed, it had been years since the school had done so collectively. Hence, my first challenge. My second and most agonizing challenge was finding a way to make the assembly meaningful. I was inspired by the Lest We Forget “soldier project” I had done during my recent participation in the Cleghorn Battlefield Tour for Canadian Teachers. I knew of high school students who had successfully completed the research project but had never heard of elementary school students attempting the same . This meant that my goal had to be twofold: strengthen the students’ reading and writing skills while working on a project that also reinforced their historical and critical thinking skills. Rather than attempting to cover WWI and WWII, I decided on something more current. 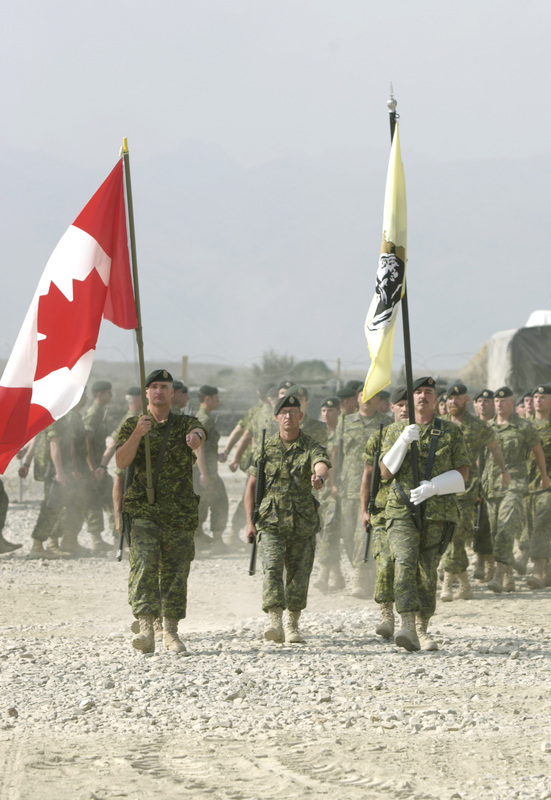 Our goal was simple: Research the life and death of every fallen, Canadian Soldier deployed to Afghanistan. In groups of two, each student adopted a soldier over five weeks, or 250 minutes of class time. The students were completely immersed. Students watched documentaries, interviews and researched online any information they could find about their soldier. The students discussed their research with one another. Class discussions on what it meant to be ‘technologically literate’ often came up as we relied heavily on the internet for information. Students worked hard on their spelling and grammar as they knew their research would be presented to the school and posted in the hallways. Although I never assigned any homework, students worked on their soldiers at home while sharing their research with their families. 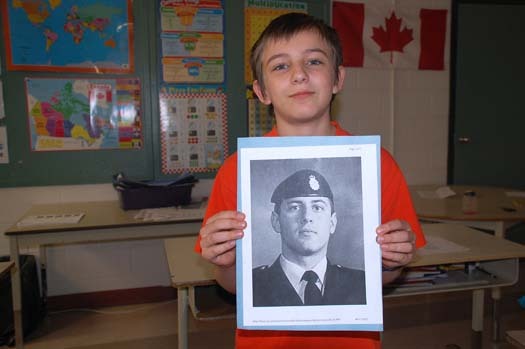 Just days before the assembly, the most unexpected of things happened when we posted the research and pictures of those fallen Canadian soldiers along the walls throughout the school. Much to our surprise, other grades were inspired to discuss our soldiers in their classrooms. I was amazed when a teacher told me her grade four student ran up to her and asked: “Why is there a picture of girl soldier on the wall? How could a man ever try to kill a woman?” Conversations like this spurred debate throughout the halls and classrooms. Additionally, we were overjoyed when the editor of the local newspaper contacted me to cover the remembrance project. This in turn overflowed into the community and once again into the students’ homes. On the day of the ceremony, my students presented their soldiers to students from grades three to six, or roughly 250 students, teachers and administration. Much to their chagrin, they only had thirty seconds each to share their research. Some students chose to share the most beautiful parts concerning their soldier’s lives. Others shared some of the most devastating. The result was a beautiful collage of who these men and women were. In essence, they brought the names and faces of these soldiers to life by giving their life meaning. The climax was when we had our moment of silence. Later, our Principal, Mrs. Kathleen O’Reilley, said she was touched by how respectful the students were. It spoke to volumes to how seriously the school had taken this project. Looking ahead I know what improvements we can do for next year’s ceremony. I know we perpetuated some of the less original and more typical ceremonial projects such as “In Flanders Fields/Au Champs D’Honneur” (although I was so proud of the students who practiced in both French and English tirelessly to the point where they probably saw poppies in their sleep). My mission for the academic school year is to create interesting projects for my students. Projects that will give them the opportunity to strengthen their literacy and historical thinking skills while reaching out to the community with an understanding of war and peace in this country and around the world. Not an easy task but just like them, I am up for the challenge. We should never underestimate our students and their capabilities in historical thinking, especially on challenging topics such as remembrance and Canadian military history. Alexandra Papazoglou is an elementary teacher in Montréal, Quebec.